Prof. Gregg Mitman and filmmaker Judith Helfand in an environmental filmmaking course. The Graduate Program is committed to helping our students develop the skills required for them to meet their professional goals. Professor Cindy Cheng and colleagues have created a resource webpage for our undocumented community on campus. Please help us in spreading the word. 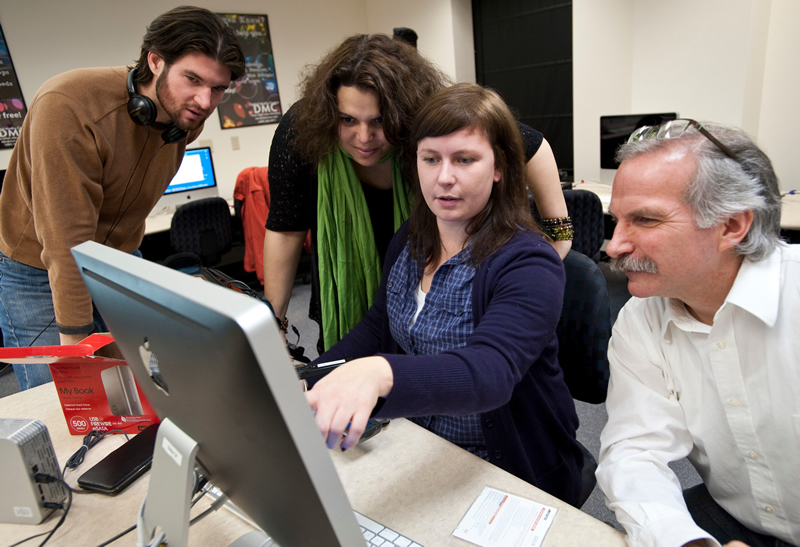 Faculty frequently teach professional development seminars (History 710) on a wide range of topics, such as writing for non-academic audiences, producing digital history, and succeeding on the job market. To see where many of our recent graduates are currently working, peruse Our Graduate’s Careers. We archive recordings of our career events, sample application materials, and other useful resources on our professional development Canvas site. All current grads are automatically invited to access it. If you need another invitation, contact Grad Program PA Cori Simon. 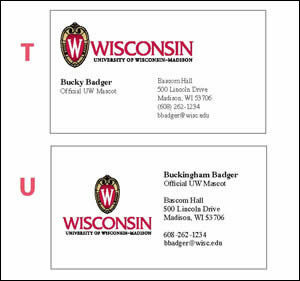 Graduate students may order their own business cards through StudentPrint. Cards may be ordered in sheets of 24 and are printed on 100lb bright white paper. Their turn-around time is typically two business days. We recommend choosing one of the pre-designed templates pictured here. Order by letter (Template T or U) and provide your individual information (e.g. name, title/department, address, phone, email, etc). If you would like to design your own card, it may be formatted either horizontally or vertically, and must measure 3.5 x 2 inches. If your design is in full color, please include a 1/10 inch bleed around your document to allow for cutting. If you would like to order one or more boxes of 500 business cards, you should have them made by DoIT’s Digital Publishing and Printing Services. Contact Jana Valeo if you need help ordering business cards. The Graduate School’s Professional Development portal offers information on a variety of professional development opportunities. Via the portal, you can access the Individual Development Plan, an advising tool. (Our Advising Qs is a similar option.) Other options include DiscoverPD, a tool that allows you to review the nine areas of professional development, complete a self-assessment, and get a customized report of your strengths/weaknesses and recommendations to help strengthen your abilities in each area. See also its Career Pathways and the Versatile PhD. The American Historical Association (AHA) is the overarching professional association for historians working in all geographical area and historical periods. It offers discounted membership rates for students and a wide array of member benefits. Its annual meetings are held the first weekend after New Year’s Day and draw several thousand historians. The AHA’s Jobs & Professional Development page serves as a portal to an array of career resources, including the Career Center (job listings) and its Mellon-funded Career Diversity for Historians initiative.